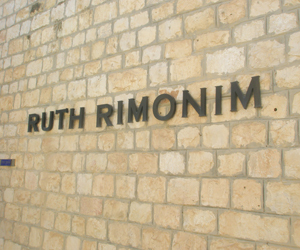 The Ruth Rimonim Safed is a very picturesque hotel built on the site of a 17th Century Khan or Turkish Inn and is part of the Rimonim group of hotels. Located in the Artists Quarter, on Tet Zayin Street, it is in easy walking distance of all the sights and is an ideal place to stay for a romantic getaway. The hotel has a total of 80 rooms, and each guest room is unique. The delightful garden rooms all have their own terrace, while the modern rooms in the new section have spectacular views of Mount Meron. The Rimonim has also Deluxe rooms , both of which have a Jacuzzi bath in the bathroom. The hotel also offers a spa, and for business travelers there are meeting and conference and events facilities . Meals are served buffet style and there is a wide selection of both hot and cold appetizers, main courses and desserts. With so much food to choose from it is almost impossible to do it justice. The breakfast alone will probably get you through a whole day's sightseeing! And as for the evening meal, if you stay at the Ruth Rimon for any length of time you could easily find you've put on a few pounds by the time you get home. Exploring the extensive grounds is very relaxing and there are lots of nooks and crannies where you can sit and read a book, talk, or just admire the view. There is even a hammock and a swing seat hidden in the gardens where you can enjoy a romantic evening watching the sunset. The outdoor pool is open in summer and even if you don't want to swim, lying by the pool is a great way to unwind. There are also a good variety of treatments on offer in the spa, which is open all year round, where you can pamper yourself and relax. When driving up to Safed from the bypass road, continue up Hanassi Street until you see a sign for the Ruth Rimon, then turn left into Tet Zayin Street and continue until you see the parking lot in front of the hotel. Drive past the bus station up towards the Old City and turn left at the circle onto Palmach Street. Continue along Palmach until you reach the circle in front of the Saraya, (Wolfson Community Center). Go round the circle and turn right down Hanassi Street, turning right into Tet Zayin. When you see the sign for the hotel, prepare to turn into the parking lot. Prices range from $175 a night for a couple for a basic room and breakfast in the low season to over $1000 for two nights, full board?? , in the height of summer in one of the suites.